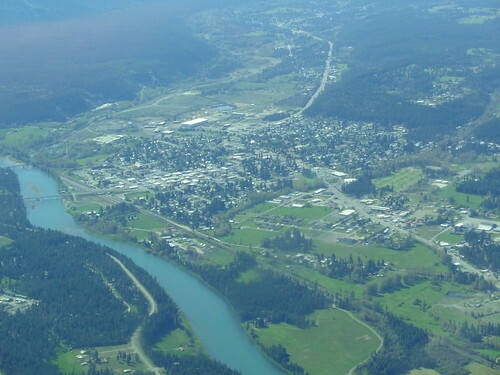 The town of Libby itself is a beautiful community of about 2,700 people nestled up along the banks of the Kootenai River in the northern end of the Kootenai Valley. 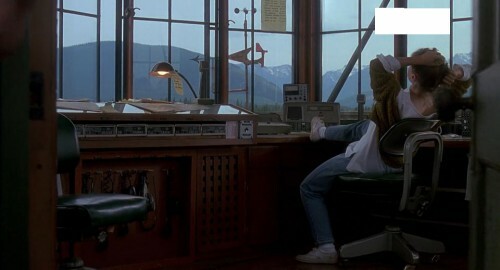 The scene in the “dance hall” where Goodman delivered that quote above is somewhere in Libby, but a good chunk of the movie was shot at the Libby airport, which is about 7 miles to the south. 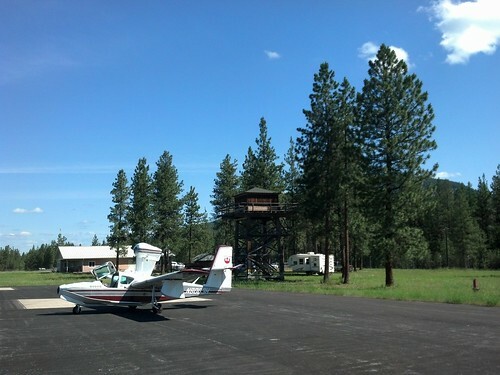 The airport is mostly surrounded by trees, and beyond them are the tall peaks that rim the Kootenai Valley. We flew in from the north and entered a downwind for runway 33. There wasn’t a single plane in the air and almost nobody at the airport. The winds were a few knots from the north, so we landed coming in from the south. 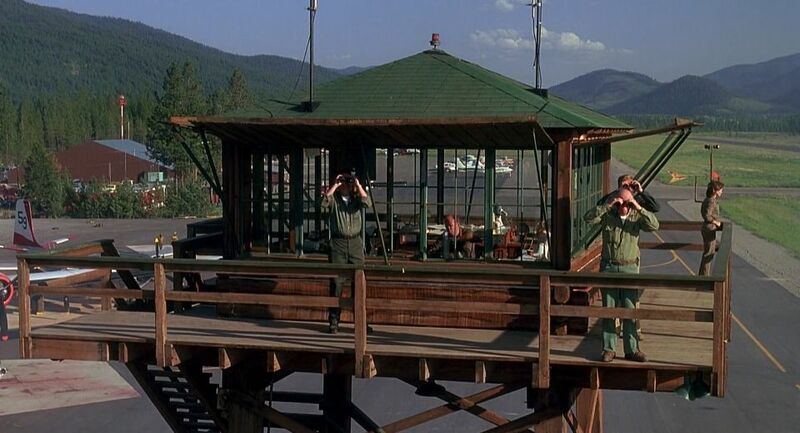 One of the most distinctive features from Always is the airport tower, built to look like a raised fire observation post. 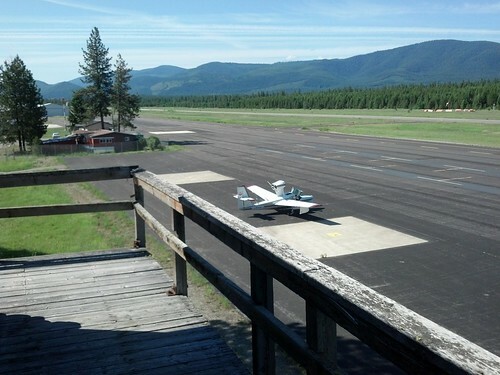 It was new for the movie, originally placed out at the northwest edge of the ramp near the taxiway. Here’s a shot of the top of the tower from the movie. Holly Hunter’s standing on the right side. You can clearly make out how forward it was on the ramp. Sometime after filming, it was moved back just off the ramp and under some trees. It still stands today. 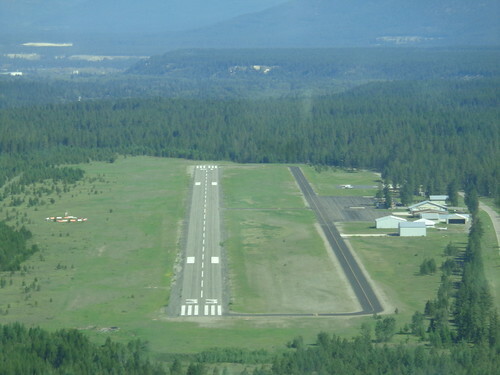 After we landed, we taxied up from the south, and because the tower is set back, it was hidden from our view until we came up enough to get past an outcropping of buildings. We parked toward the back side of the large ramp that’s near the tower. I confess I did get something of a geek-fanboy feeling parking an airplane with a Rebel Alliance insignia on the tail next to such an iconic structure from a Steven Spielberg film. But what was even more cool was getting to climb up the tower and walk around a bit. It’s entirely possible to do this, but you have to be somewhat careful. The tower was not built to last 15 years. The major beams of the tower appeared to be solid, but the upper flights of stairs were questionable. The upper deck itself felt fairly stable, but I wasn’t going to rely on the deck’s fencing for any degree of safety. The door to the inside of the tower was closed, but it didn’t appear to have any lock on it. It swung open reasonably, about what you’d expect from a very old wooden door left out in the rain for over 15 years. The interior itself was in shockingly good condition. The corner where Holly Hunter grieved for a recently exploded Richard Dreyfuss looks not terribly unlike it did in the movie. 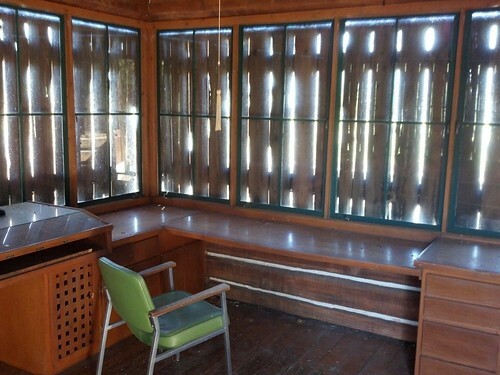 The chairs are different, but the windows seem to all be the originals. It was exciting for me, being able to walk around a bit. “They filmed this scene here, that scene there.” That sort of stuff. What was striking to me was how much had changed since the film. The big lodge-looking building from the movie is gone, and many of the other nice-looking wooden buildings from the movie are gone. The gigantic blue taxiway lights aren’t there anymore, and the lean-to fencing is all gone. We did, however, run into a couple of smokejumpers who were camping at the field. One of them had watched the movie the weekend before, so we traded quotes for a while. 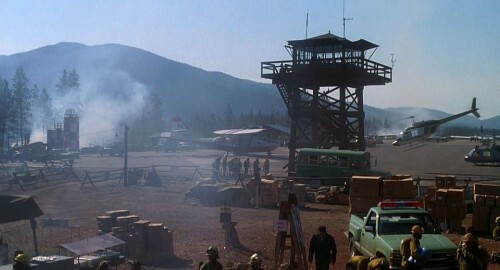 On our way to Libby and its airport, we crossed over Bull Lake, which is where the iconic opening scene was shot. I was a bit surprised how “built-out” the lake looks now. It’s still predominately rural, but most of the eastern shore of the lake has small homes on it. 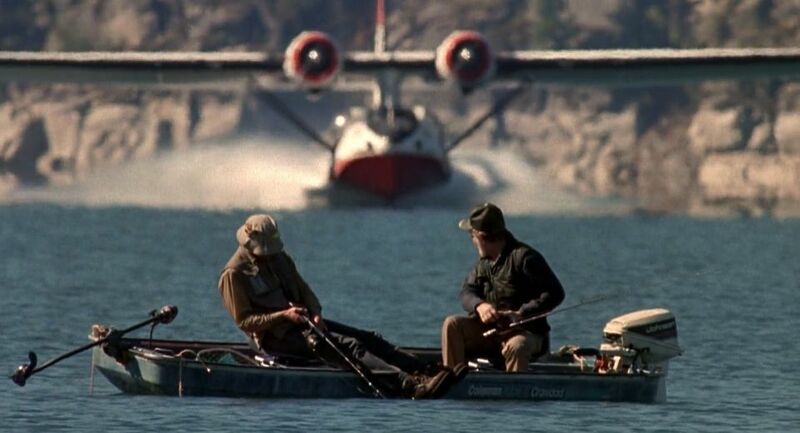 We only passed over the lake once, so I wasn’t able to determine with any certainty where on the lake they filmed the opening scene, but my guess is that it was toward the southern end, with the camera pointed westward. We had a full day of fun waiting for us in Sandpoint, so we couldn’t stay in Libby for long. We never left the airfield. We visited the pilot’s lounge, then the fuel dock to get a few extra gallons in before departing. We left on much the same course as how we entered. 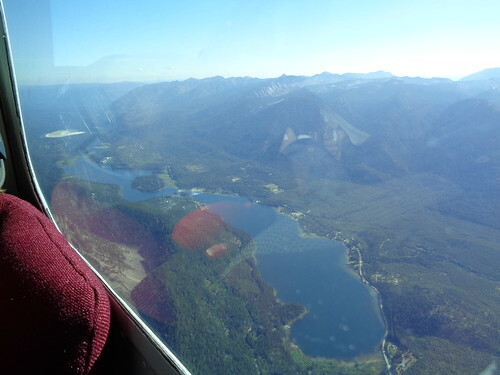 We flew north as we climbed, flew over Libby itself, then the river, and then up to the northwest over Troy before turning south at Bonner’s Ferry. 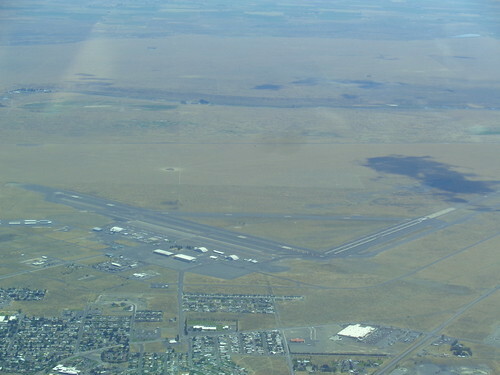 A few days before the Libby visit, we flew from Yakima to Spokane, and in so doing overflew Ephrata, Washington. 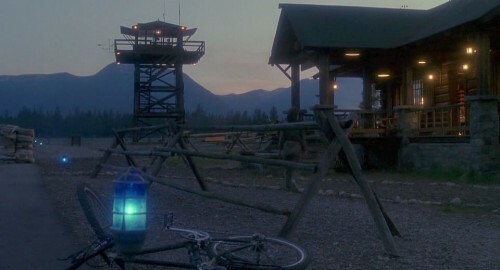 This is where they filmed the “Colorado” scenes from the Always. Even if you like Always, you may not necessarily understand how geeked-out I was being able to visit Libby. We weren’t driving a car. We flew an amphibian airplane to the principle filming location of the movie with the iconic amphibian airplane opening scene. When I was growing up, the kids in my neighborhood pretended to be Indiana Jones and Luke Skywalker; I pretended I was Jock Lindsey and Wedge Antilles. For me, visiting Libby airport and climbing the tower might be similar to a Star Wars die hard being able to fly an X-Wing into Skywalker Ranch. Best of all, I got to do it with my family. All the feelings.